I get this question a lot – I mean all the time, “Why is coconut oil healthy?” Or some version of that. I’m sure all the other coconut oil fans out there are getting the same questions from their friends. Today’s post will help you out with that. My top health benefits all in one place. So bookmark this, share it, save it, reference it a lot. One food, (almost) countless benefits! Supermodels aside, you’ll be hard pressed to find someone not concerned with their metabolism. I’ll admit it, I hate dieting. I don’t care how fabulous I’ll look, or how easy it is to follow, I can’t do it. It’s mental. What I can do is keep a food journal. By tracking what I eat, I eat better. 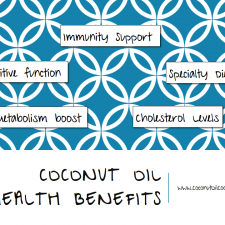 Because coconut oil is digested as a source of energy, it can in turn rev up your metabolism. So if you’re working out, replacing the fats you may currently have (read: vegetable oil or butter), switch them out for coconut oil and your body will thank you. Coconut oil is considered a superfood for a reason. One of the many reasons is because it’s anti-fungal and anti-bacterial. While this is great for relieving bug bites and rashes, it’s even better for your immune system. The medium chain triglycerides found in coconut oil may actually help fight off the common cold. Already have a cold? Coconut oil can help with that too! From mixing it in your tea to creating natural cough drops, this tropical oil can be your immune system’s best friend. This is a huge one. Turns out, a lot of people are surprised a saturated fat may actually IMPROVE your cholesterol. New research suggests having higher HDL, or good, cholesterol and lower levels of LDL, or bad, cholesterol may reduce the risk of developing other health issues including heart disease and Alzheimer’s. 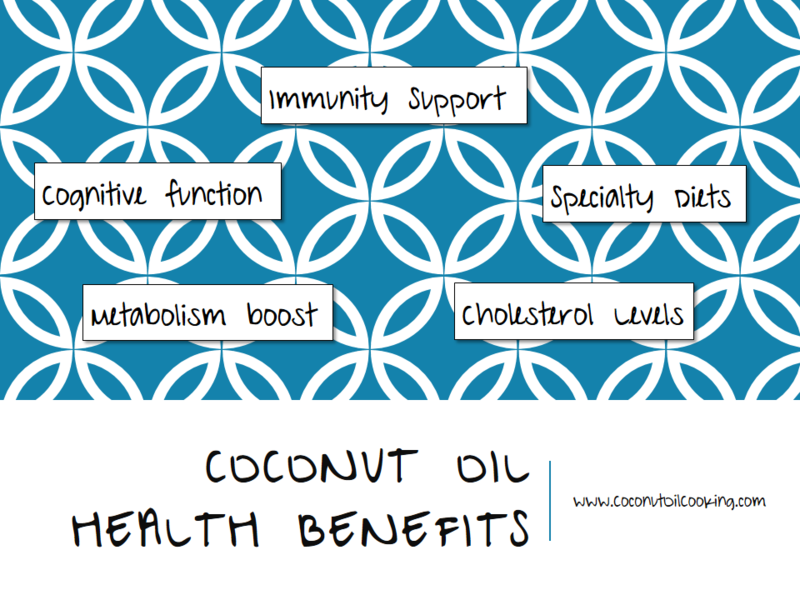 Coconut oil has been found, in some studies, to raise HDL and lower LDL. Bet you can’t say that for butter! This one is one of my favorites. Whether you have a gluten sensitivity, are vegan or vegetarian, or diabetic, using coconut oil can be your best friend when cooking and baking. As a naturally gluten-free food, coconut oil adds much needed moisture to alternative flours. Give our gluten-free peach cobbler or Carolyn Ketchum’s Gluten-Free Coconut Banana Chocolate Chip Breakfast Cake. And anytime you swap out butter for coconut oil – you’re one step closer to making any dish vegetarian friendly. Just give these pumpkin sugar cookies a go, we promise you won’t miss a thing! Coconut oil doesn’t take any insulin so a lot of people use coconut oil as part of a healthy diet to manage their diabetes. Here’s what I consider the coolest part about this food. Coconut oil has been found to actually help people with Alzheimer’s disease. While we are far from a cure to this disease, the energy created when coconut oil is broken down, called a ketone, may be able to act as a substitute when the brain can no longer use glucose to fuel itself. That’s the exact theory being studied at the Byrd Alzheimer’s Institute. To me, that’s amazing that a food we can eat can have this much impact on our lives. I hope you can use this list the next time someone wants to learn more about why they should make the switch. Let us know what you say to convince people to use EVCO in their diets in the comments below.